Look, the stand isn't in the middle! The Acer screen - look how off-centre the stand is! 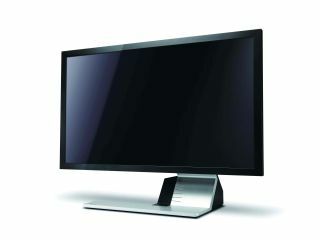 Acer has unveiled it latest LED monitor, the snappily-monikered S243HL, featuring an 'unprecedented' 8,000,000:1 contrast ratio. The 24-inch monitor features LED backlighting, and uses a dynamic backlight to only illuminate the portions of the screen necessary. The means richer colour reproduction with a longer lifetime, as well as providing cost savings through up to 63 per cent energy savings. The S243HL also has a 'distinctive' base, with a brushed metal base supporting an off-centre stand, as well as space to store a keyboard. It's full 1080p resolution with a 16:9 display, with two HDMI ports to connect up other high-definition sources, as well as a speaker in the monitor stand. It's not the most expensive in the world either at £249 (although some might think that's a ludicrous price for a monitor). But if you want a massive screen with decent colour reproduction, then you could find a lot worse out there for the money. Go to www.acer.co.uk for more details.